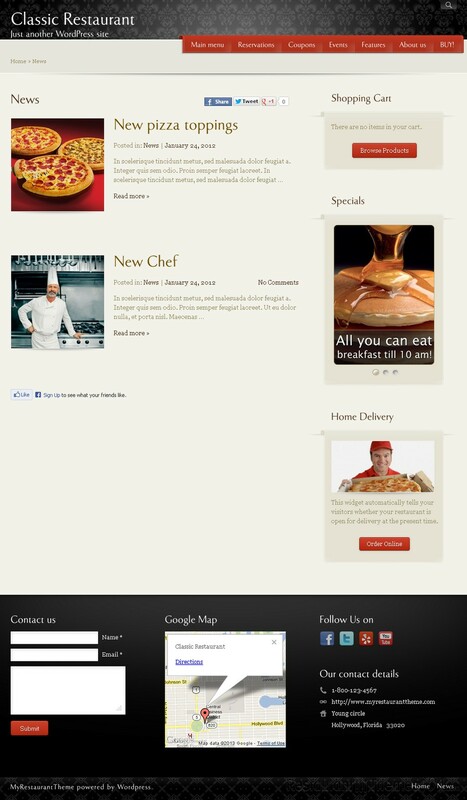 MyRestaurantTheme is a premium responsive restaurant WordPress theme. 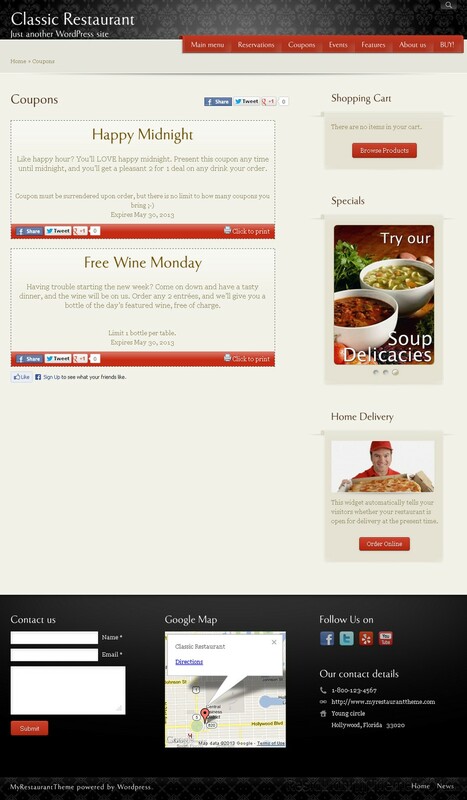 It offers 4 elegant and unique design styles you can choose from, and one of them is Classic theme, created to fit just about any kind of a restaurant you might be running. The theme looks gorgeous, and being responsive, it will surely look pixel perfect no matter what device it is viewed from. The layout brings classic elegance with carefully chosen colors and patterns. The colors prevailing are gray, white and red. The homepage features a wide slider where you can add photos of your delicacies or some photos of the pleasant ambient of your restaurant so you can grab your visitors attention right away. The menu list is nicely categorized and shown on the homepage in sliding form, along with photos and prices of your dishes. You can add your chef’s recommendations and your daily specials right under your menu, along with thumbnail photos and some intro text, and by clicking on the thumbnail your visitors will be redirected to a page where you can describe your dish in details and add photos. 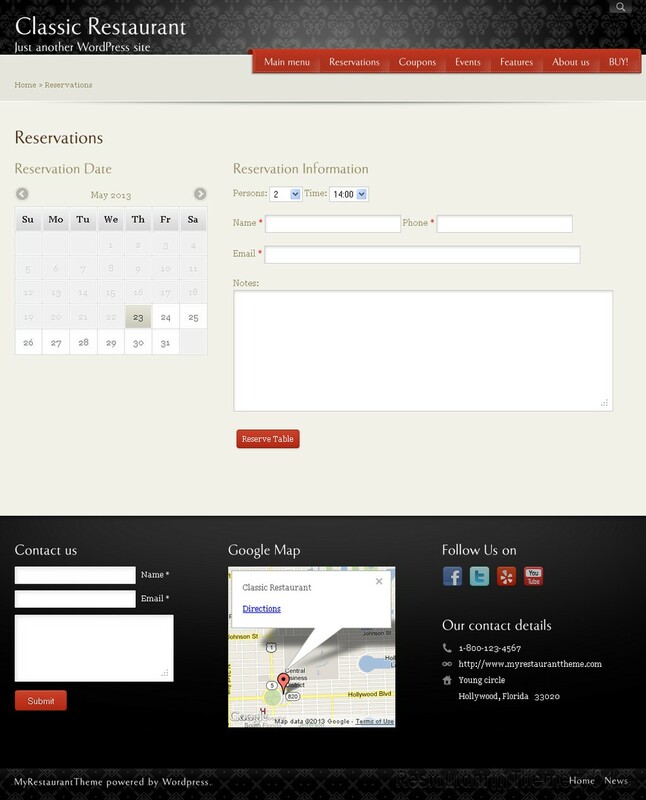 This theme features many great options, and among them is a nice reservation form so your guests can book a table right there on your website. Classic Theme is also OpenTable compatible, and you can add and announce upcoming events and always keep your visitors updated with the newest happenings at your place. A nice and simple contact form was also added to this theme, so your visitors can easily send you a message in no time. Classic restaurant features Google Maps so everyone can get clear directions to your place. Social integration is also very important and this theme will allow you to connect your website with your Facebook, Twitter, Yelp and YouTube account for easier content sharing. The theme is highly customizable, you can change just about anything, and you can do it all by yourself, as it comes with extensive documentation included and it’s very easy to make the customizations.